The march to AXIS begins here as the Uncanny Avengers are reunited! The threat of Kang is over, but what are the repercussions? 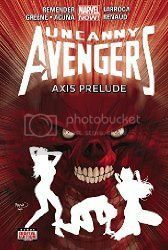 A dark secret is revealed in Genosha, Havok and his team are defeated at the hands of the sinister S-Men...and the Red Skull's revenge is now unstoppable. The great vanishing has begun, the Uncanny Avengers are too late...and Havok witnesses the Skull's greatest atrocity yet! Meanwhile, Magneto discovers the Skull's possession of his dead friend Charles Xavier's brain and powers and becomes determined to shut the villain's scheme down! Prepare for a Magneto vs. Red Skull blood match that will result in a terribly altered Marvel Universe! Plus: the Mojoverse gathers an all-new, all-creepy Avengers! It's the shocking debut of the Avengers of the Supernatural! This lead up to the AXIS crossover event does a fair enough job of laying the groundwork for the subsequent story, but there are still things about the overall story that bug me: Why does the Red Skull hate mutants so much (other than needing him to in order for the AXIS storyline to work...)? If he hates mutants so much, why fuse the brain of a mutant to his own? Why have mutants as part of his S-Men if he hates them so much? Why does it take "killing" him to release Red Onslaught? There is quite a bit of suspension of disbelief and just accepting things as they are written required for this storyline to work, and I feel that's a bit of sloppy writing and planning, right there. The other thing that really bugged me about this collection is if you are going to have parts of the story branch off into other series (part of the overall story plays out in Magneto, make sure that everybody is on the same page with how the characters look and how the story is working in the other issues. When the story transitions from Magneto back to Uncanny Avengers, and the story picks up right from one issue to the next, it's incredibly tacky that the characters are not wearing the same costumes, nor to the stories line up with the action that takes place from the last pages of Magneto to the first pages of Uncanny Avengers. Continuity may not seem that important, but it is. Overall, I'm hoping that the AXIS storyline is actually handled a little better than the setup was.